Why It's So Hard To Stop The World's Looming Famines : Goats and Soda Millions of people in Yemen and sub-Saharan Africa are facing food shortages and severe malnutrition. Host Audie Cornish talks with Justin Forsyth of UNICEF about the crisis. A World Food Programme worker stands next to aid parcels that will be distributed to South Sudanese refugees at the airport in Sudan's North Kordofan state. It's the famine that not enough people have heard about. An estimated 20 million people in four countries — Somalia, South Sudan, Nigeria and Yemen — are at risk of famine and starvation. And the word isn't getting out, says Justin Forsyth, a deputy executive director of UNICEF. Speaking with NPR's Audie Cornish on All Things Considered, he explained that politics and donor fatigue are two of the main causes. "Politicians around the world are very focused domestically on politics at home, not on international issues," Forsyth says. "In addition, some of the public fear that their aid money hasn't really made a difference when they've provided it before." 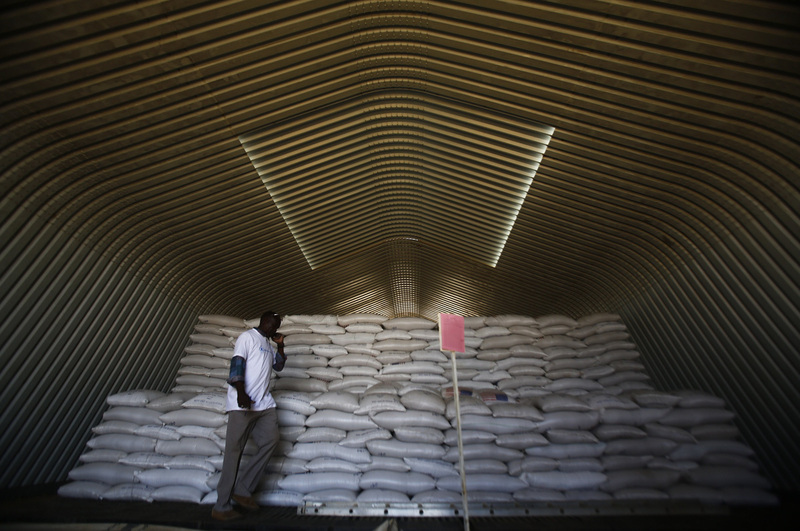 The severity of the famine has prompted an unprecedented response from the aid community. Agencies usually raise funds on their own. But this week, eight international aid organizations — including Oxfam, the International Rescue Committee and Mercy Corps — banded together to form the Hunger Relief Fund. Forsyth spoke to NPR about what the U.N. is calling the worst humanitarian crisis since 1945. The interview has been edited for length and clarity. How do you explain what's happening right now? In these four countries of Yemen, South Sudan, Somalia and northern Nigeria, we've got a combo of [not only] drought but conflict, too, which has really tipped some of these countries, or regions of these countries, over the edge. And this is a very severe situation. In these countries, 1.4 million children face death because they're severely malnourished — which means a small thing, an infection, diarrhea, would tip them over the edge and allow them to die. So we're racing against time to help save these children that are in this very difficult situation. Let's begin with Yemen, because it has the largest number of people in need. UNICEF says 400,000 children are severely malnourished. And that's not the only problem in Yemen. There's a terrible war that's been going on many years in Yemen. It's led to the destruction of the whole health system, a lot of the water and sanitation system. So not only do we have a nutrition crisis, with many children starving, we also now have a cholera crisis with many children facing very severe consequences of either what we call acute watery diarrhea or cholera, and both of them kill young children. Many of the health workers, doctors, nurses aren't even being paid. [The children] don't get the right support, and they die very quickly. In Nigeria, the famine is somewhat regional — the northeast region of the country affected by fighting, by Boko Haram. Somalia is facing political fighting but also drought. These are terrible humanitarian situations, or looming famines. In a very remote part of South Sudan I went to a UNICEF-supported health clinic and they'd been completely looted. There were children lying on the floor. Even the beds had been taken. We're fighting for the lives of children, but at the same time, we're trying to do it in these very difficult situations. The different warring factions [are] producing big obstacles to us being able to save children's lives. What happens when your teams try to address this? In the very, very difficult situations, we're basically just trying to keep people alive. In South Sudan at the moment, or in Yemen, we're doing surge teams out into remote areas where there's fighting and we're doing emergency work, often with other U.N. agencies like the World Food Programme or the World Health Organization and other nongovernment organizations like Save The Children. We're working with them on the ground. Literally, we're providing things like Plumpy'Nut [an enriched peanut paste], which is this emergency food we give to children. It's very high in nutrients. It's really lifesaving work to pull children back from the brink. In these very extreme situations, we're really doing sticking-plaster jobs of keeping children alive. Is this something that can harm a generation in a region? Individual children's lives can be ruined forever. From having not enough quality food with nutrients for those first few years of a child's life it stunts them not only physically but also mentally, so they never really have a chance to recover in later life and to fulfill their potential. Just last month there was an announcement that South Sudan was no longer facing famine conditions. How did that happen, and is there danger it could slip back? So there was famine declared in two parts of one state in South Sudan. I've been there, and I've seen it firsthand. And there was a very intense response which allowed that area to pull back from famine conditions. So we might have actually stopped famine in those two counties in that one state. But the number of children in South Sudan who are still severely malnourished has actually gone up dramatically. We've managed to do a lot on the ground in South Sudan, but also Yemen, Nigeria, Somalia. Not just UNICEF, but other organizations, too. We've acted early, we've gone to scale, but the crisis is so big that we have to redouble our efforts in the coming months if we're going to get on top of it.